If you “flip” to pages 18 and 19, you will see a story by yours truly. It is a quirky little ekphrastic tale, though you can’t tell it: I wrote it during a Creative Writing course in college. The assignment was to choose a photo and write a story based on it. I wish I still had the photo, although I do remember what it looked like: an oppressed-looking woman held a baby while surrounded by a passel of children. Her eyes drooped and she looked unkempt. I asked myself what her story was as I stared carefully at a red mark around her wrist, and the story grew from that. I have always been fond of the story, and I’m grateful it has found a home, especially today. What an unexpected holiday treat for me. The whole magazine is well worth a read. I hope you’ll take a look at it. What Do I See in The Sea, the Sea? Author Iris Murdoch loved art. In fact, she often incorporated it into her writing. I just finished reading The Sea, the Sea this morning, and this novel was no exception: she mentions two paintings in particular. Both paintings are in London’s The Wallace Collection. The first is Franz Hal’s The Laughing Cavalier who is not really laughing, of course, but is certainly smiling. 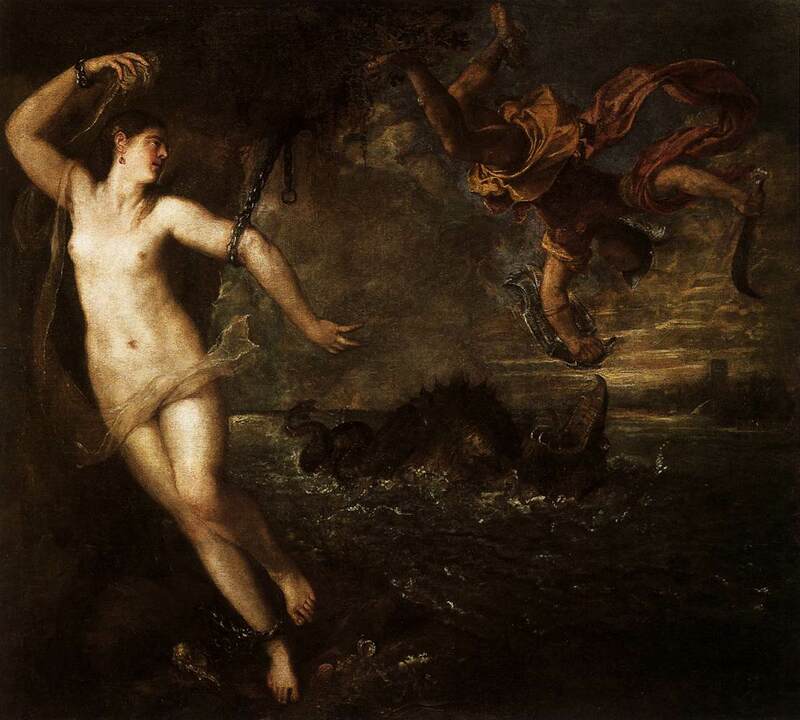 The second is Perseus and Andromeda. Besides not really smiling, in all likelihood, neither was the subject a cavalier. Charles, the protagonist of this novel, is a retired actor, thus he is used to “being” something he is not as well. That is probably the theme of this book: things are never what they appear to be. In the story, Charles sees a sea monster. He wonders if it is merely a flashback from an LSD trip, but he’s not sure. The question is, who is the monster? Who needs saving? Who is the one doing the saving? I think Charles would think HE is the one trying to save Hartley, the woman he loved and lost when he was young. When he moves to the seaside, he inexplicably encounters this woman after decades of no contact. She is married and has clearly moved on. Hartley has aged, and she is not the sort of woman Charles has been known to date. Charles, despite his age, is still a sought-after man. There is this cycle of love where a person loves someone who loves someone else, which sounds a bit like a Shakespearean play. Fitting, isn’t it, for a stage actor? Longing builds this novel, and I couldn’t resist blogging on it because it is such a direct example of ekphrasis. I really can’t say much more, in case you haven’t read the book. But think on these things, think about the paintings, and know that’s what Murdoch wanted you to do. When my baby sister, Cherokee, was very young I would read her favorite books to her on Saturday mornings. Too soon her favorite stories were from the “Choose Your Own Adventure” books. I don’t know why but I never really cared for them, but she did. In them you were given two choices at a certain point in the story: does she run away or open the door? Does he give the ball back or toss it into the street? Writing is much like those books. One of my mentors, Roy Hoffman, once said that when you write you get to a door and if you open THAT door it means you can’t choose the other and soon you are too far away to even get back to the first door. Okay, I am taking probably gross liberties with what he said, but I have long since lost my notes on our phone conversation. Still, the principal is true. That’s what’s completely wonderful about writing, and what’s so difficult about it: you have all of these freeing choices. You can remake the world. But once you’ve made those choices, unless you either have absolutely no deadlines or infinite patience, it’s hard to retrace your steps. Imagine a maze whose form is completely transformed once you head down a path, and its walls become only those which your hands press, and the rest of them disappear. I, sadly, have more patience than the average writer, which can be great, but it can also be maddening. I have been known to write twenty pages and immediately erase ten. I have brutally demoted 400 page novels to scant 75 page novellas. But even I come to those points where I have to choose, and I’m there right now: does the painter travel by brig or steamship? Which port does she leave from? To which port does she sail? Who meets her once she gets there? Once there, where does she stay? Again, it’s wonderful to have so many choices, but as the title of the series states, you do, ultimately, (as Roy stated) have to choose. But don’t be sad when all of the choices are made — there will always be new questions to ask, new adventures of which to dream. So go ahead, choose your own adventure.